My husband likes to put up a small Christmas tree on his desk at work. Last year we got him a small (18") tree for his desk, but we didn't have any small ornaments to decorate it. This year I decided we needed to do something about that. My husband is also huge geek. 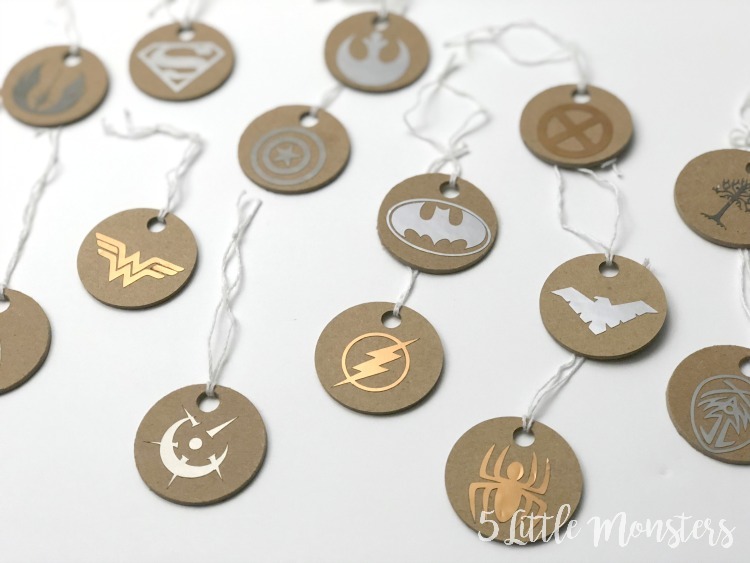 He loves everything from superheroes to Doctor Who, Star Wars to Star Trek, Harry Potter to epic fantasies, and pretty much anything in-between. Because of that I thought is made sense to do a geeky themed tree. 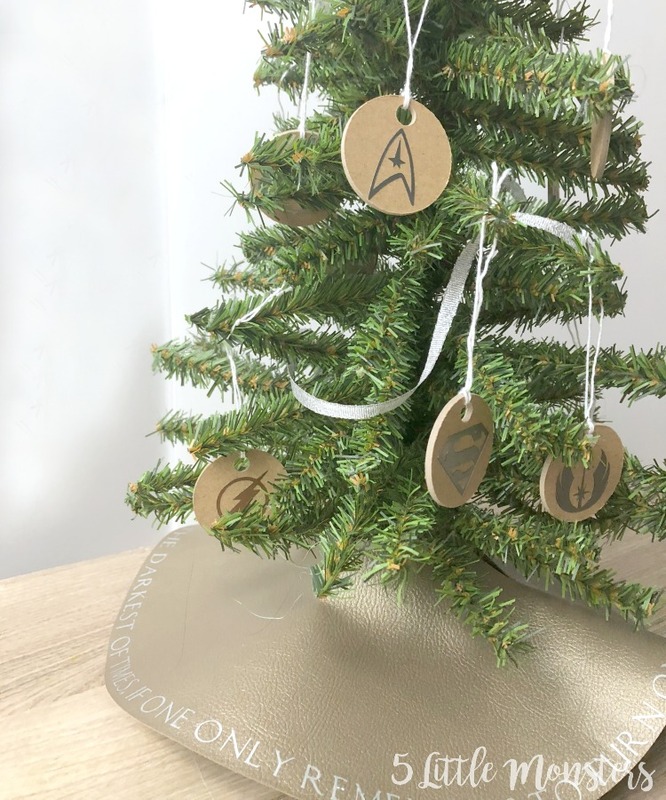 However, even if you don't want to make a geeky tree, you could use the ideas here to make whatever theme tree you would like. The first thing we did was make ornaments. I cut small circles of chipboard with my Cricut Maker. I was nervous that the holes to hang the ornaments might be too small to cut smoothly but everything cut perfectly. 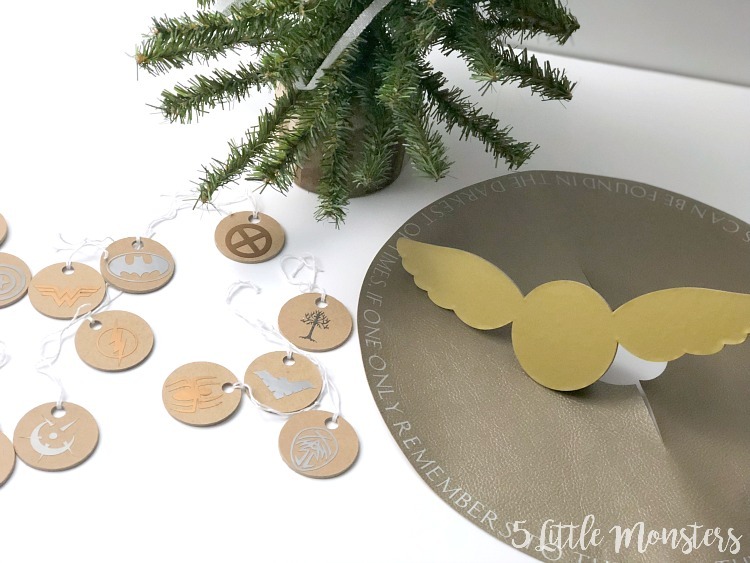 Then I had my husband make a list of 15 symbols he wanted on them, I cut out 15 ornaments. I uploaded images for each symbol and cut them out of matte foil vinyl in 3 colors, silver, gunmetal, and bronze. Then we stuck the vinyl onto the little chipboard circles. I had originally planned to paint them but we decided not to in the end and we just stuck them on the plain chipboard. Then I just tied little strings on each of the ornaments to hang them on the tree. I planned to stop there, but once I got all of the ornaments on the tree I decided it needed a topper. 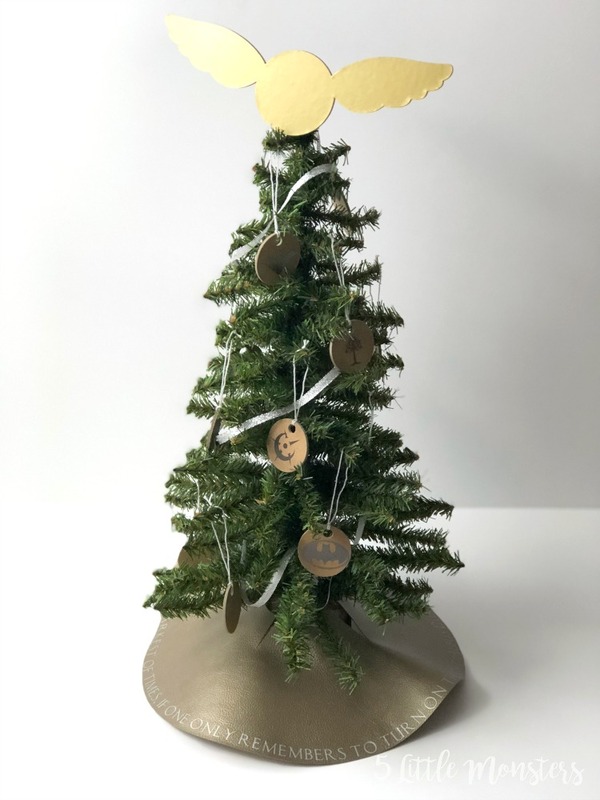 Jake realized that he hadn't had me make any Harry Potter ornaments so I came up with the idea to do a golden snitch on the top of the tree. 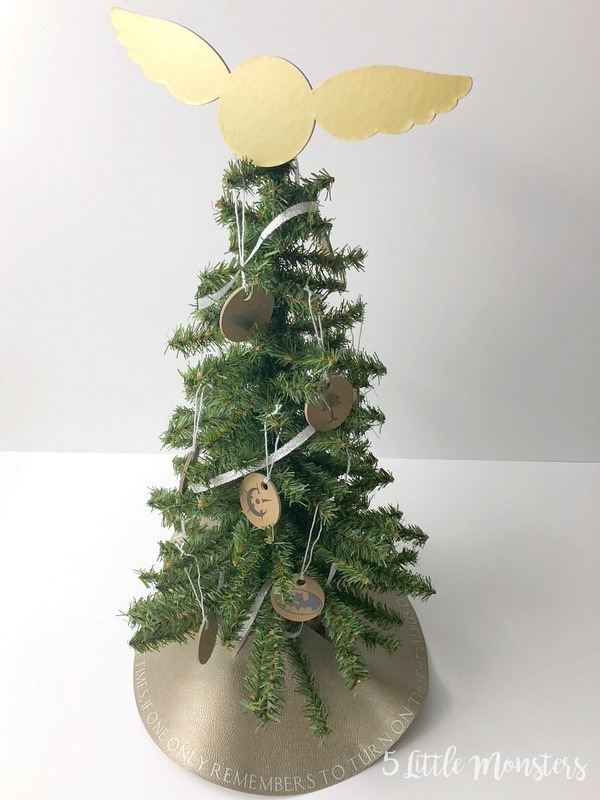 The tree topper is also make of chipboard and covered with gold vinyl. To get it to stay on the tree I cut two small triangles that I glued to the back of the snitch to make a cone shape that the top of the tree could fit into. It ended up working really well. 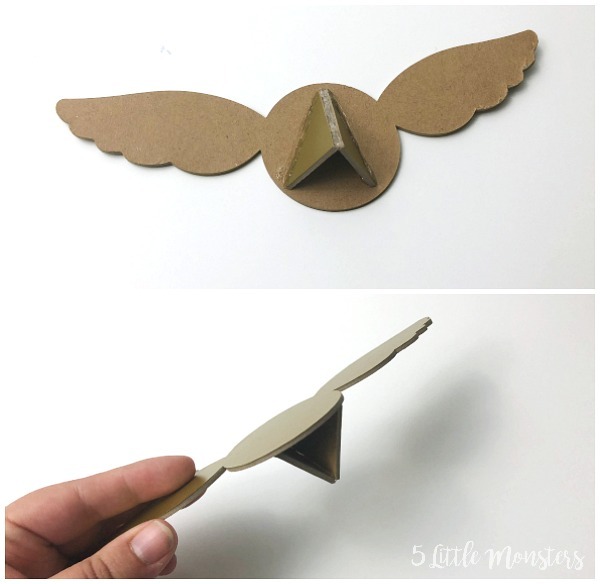 Even if you wanted to do a different shape, like an actual star, you could add those to the back to make it fit on top of the mini tree. After I got the topper on I decided that the last thing we needed to complete the tree was a little tree skirt. My plan for the tree skirt was to cut a circle, originally I thought I would cut it from felt, with a circle cut from the center to go around the tree. 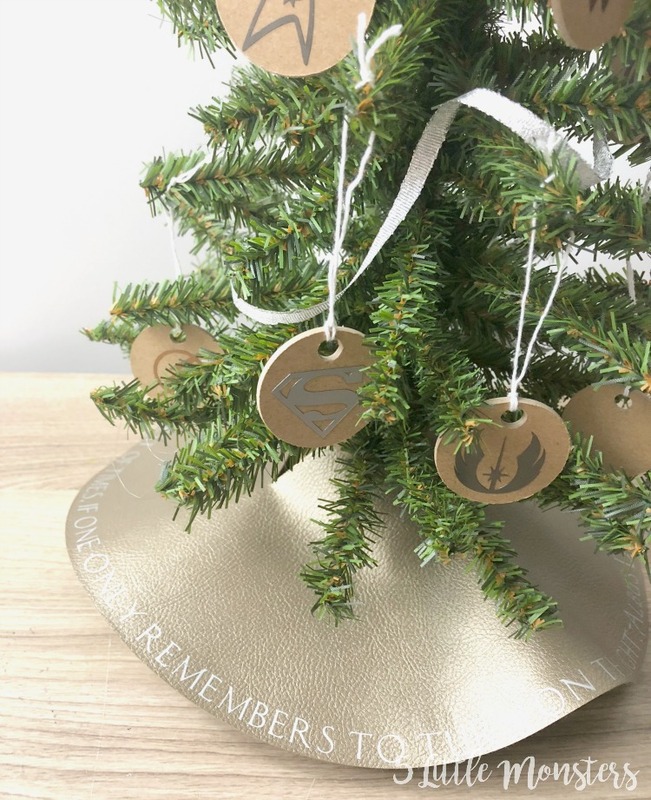 I thought it would be cool to have a quote or something around the outside of the tree skirt. I gave my husband the task of choosing a quote while I chose materials. We ended up deciding on a gold-ish faux leather, since we kind of had a metallic theme going. Then I added the quote around the edge in silver iron on. Since I wanted the hole in the center to be smaller than the base of the tree, to keep it from falling off, I cut slits on each side of the circle to be able to pull it over the base. Once the tree skirt was added the little geeky mini tree was complete and it was ready for Jake to take to work and set up on his desk. I thought it turned out pretty fun, and it could easily be adapted to whatever theme you want. Just change up the images on the ornaments and colors to fit your theme. The first thing that I did was cut out the ornaments from chipboard (Mini Chipboard Ornaments Design Space File). I cut out 5 ornaments at a time just because I wanted to be able to easily check when they were done. I cut the 5 ornaments 3 times for a total of 15. I only did about 13-14 of the 20 passes with the knife blade to get them cut out perfectly. Next I uploaded the images I wanted and sized them to fit my ornaments. Be careful with images that have really small parts because they will need to be pretty tiny to fit on the ornaments. Most of ours cut great but we had a couple that had issues. The tree from The Lord of the Rings, my husband would be so disappointed that I don't remember the actual name, but it has stars above it and we lost the stars because they were so small. Part of that may also have been the vinyl we used. Matte foil is really pretty but definitely one of the harder vinyls to cut and work with. Once I cut out all of my designs I applied them to the ornaments. I only used transfer tape on the ones that had multiple pieces, if it was only one piece I just peeled it off and stuck it in place on the chipboard. Next I made my tree topper. This is also cut out of chipboard with vinyl applied to the top to make it gold. 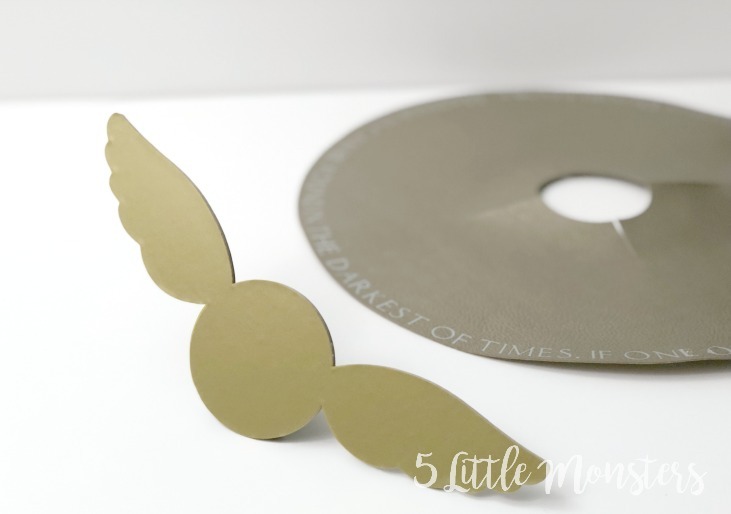 (Golden Snitch Tree Topper Design Space File) I cut the design out twice, once out of chipboard, and once out of gold vinyl. I then stuck the vinyl on the pieces of the topper, again no need for transfer tape. Then I took the two small triangles and glued two of the long sides together at an angle, so that with a third side it would make a pyramid type shape. Then I glued that piece, along the other two long sides, to the back of the snitch piece. If you want to use the same idea but with a different shape just cut the two triangles with whatever front shape you want. Last I made my tree skirt. 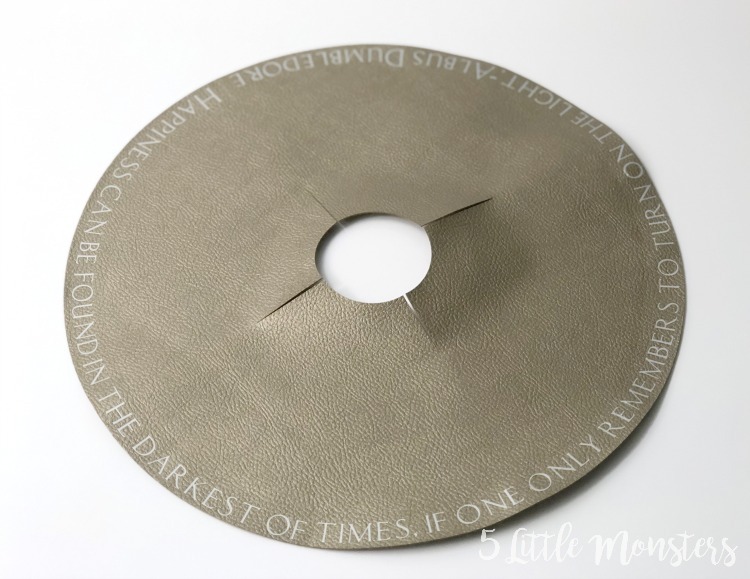 I cut the circle out of faux leather, you could also use felt, fleece, or any other fabric. (Mini Tree Skirt Design Space File) Next I cut the words of the quote out of silver iron on. To make the quote I just typed the words out in one long line. Then I used the curve function to curve the text. To curve it out I slid the slider all the way to the left, then I moved it back to the right just a tiny bit so that I had a small space between the beginning and end of the quote. Press the iron on onto the tree skirt following the recommended settings for the fabric and iron on you are using. Add strings to your ornaments and hang them on the tree. If you want you can wrap some ribbon around the tree first. 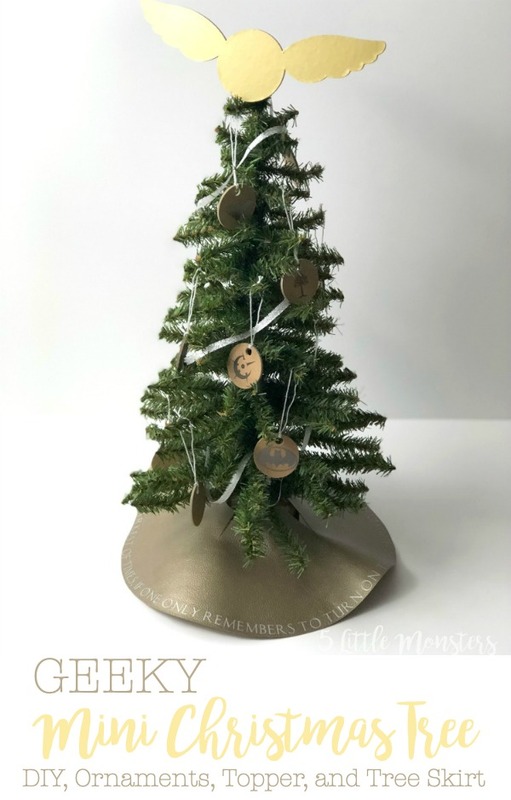 Then add the tree skirt around the bottom and the topper to the top and you have a cute little tree to set up on a desk or tabletop.